We’re an ROI-focused, full-service creative agency with a passion for regional business, health & wellbeing, sustainable and renewable practices – and all things that make this world a better place, really! While we operate mainly in Canberra, the Riverina and Sunshine Coast, our clients are based all over Australia. So what’s our point of difference? A labyrinth is a meandering path, corresponding to a very old rhythmic structure or pattern. Walking a labyrinth helps us focus and unearth new insights, but also find rest and enjoyment. The way out means following the same path in reverse – emerging feeling energised and ready for action. We created a bespoke five-circuit labyrinth to represent the journey we walk with clients. 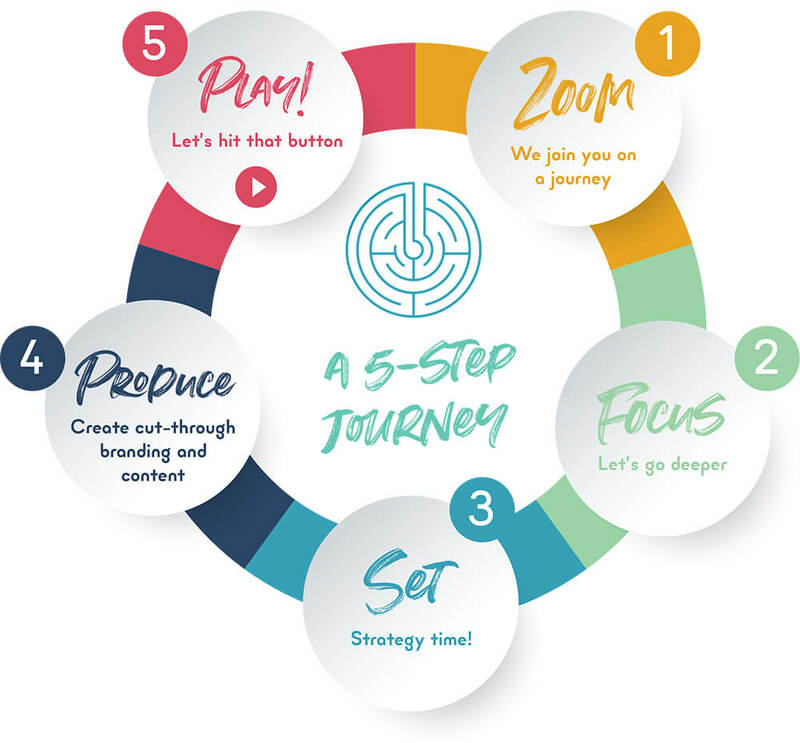 Our proven 5-step process helps deep-dive and uncover the real needs of our clients. 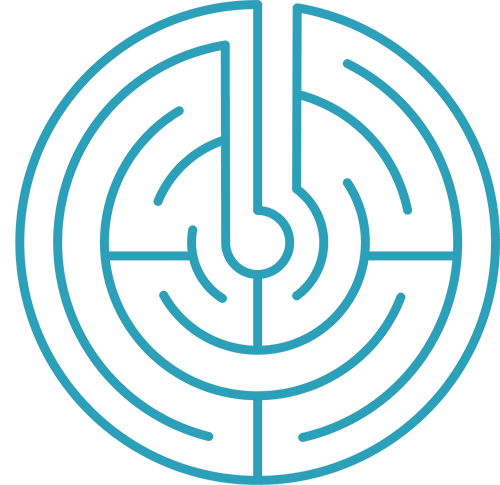 The integration of the ‘b’ character into the lines that form the pathway into the centre of the labyrinth. The 5 circuits represent the 5 steps of the process. We were inspired while watching ‘Beneath Hill 60′. In Belgium during WWI, the 1st Australian Tunnelling Company dug passageways to lay mines and aid the advance of British troops. These were made in the layer of “blue clay” – 25-30 metres below the soggy, upper-level soil. The tunnellers emerged looking like Smurfs! We believe it is perfect to reflect the work we do. Blue represents our corporate side, while our creativity is represented by the endless creative power of clay! Abstract from Prisoners of our Thoughts, Viktor Frankl. Symbols can move or inspire. They can be simple, yet layered with complexity. Symbols can speak to our unconscious mind and stirring us to a deep level of intuitive wisdom. To understand symbols is to obtain a profound insight into what it means to be human. Blue Clay has a proven 5-step process to help deep-dive and uncover the real needs of clients. Every step is a partnership. No-one knows your business like you, we just have the tools to help get your message to the right people.